The Cassini spacecraft looks down on Dione. The spacecraft's last close flyby of the Saturnian satellite will take place Monday (Aug. 17). Image taken June 16, 2015. The Cassini spacecraft will make one last close flyby of Saturn's pockmarked moon Dione today (Aug. 17), in search of direct evidence that the moon is geologically alive and active. Cassini, a collaboration between NASA, the European Space Agency and the Italian Space Agency, has been studying the Saturn system since 2004, and its grand mission will come to a close in 2017, after the spacecraft makes a series of dives through the space between the planet and its rings. On Monday, Cassini will make its fifth close flyby of Dione, coming to within 295 miles (474 kilometers) of the moon's surface, at approximately 2:33 p.m. EDT (6:33 GMT). During the flyby, instruments onboard Cassini will make gravity measurements that will help scientists better understand the moon's internal structure, which they can then compare to the inner structures of Saturn's other moons. 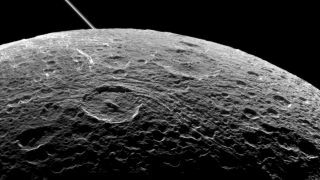 Cameras and other instruments onboard will also image Dione's north pole with a resolution down to a few feet, while the Composite Infrared Spectrometer instrument will study areas on the moon's surface that exhibit the unusual ability to trap heat. Saturn is the second-largest planet in our solar system, and is spacious enough to contain more than 760 Earths. However, this giant planet has a very low density. Composed mostly of hydrogen and helium, it is only 95 times more massive than Earth, and would float in water (if there were a pool large enough to hold it). The gorgeous gold bands that run across the planet's surface are created by winds in the upper atmosphere that can reach speeds of up to 1,100 mph (1,800 km/h). The ringed planet has a total of 62 known satellites, and scientists have theorized that two of its largest family members, Titan and Enceladus, might host underwater oceans or even life. Dione was first imaged up close by the Voyager 1 spacecraft in 1980. Images from today's flyby will take a few days to reach Earth.